Exoplanet hunters around the world held their breath while NASA’s Transiting Exoplanet Survey Satellite (TESS) launched last Wednesday. Thankfully the launch was a success and after 60 days of orbit manoeuvring and engineering tests, TESS is expected to begin its initial two years of science observations. The question is: how many planets do we expect TESS to find? The TESS mission will observe 90% of the sky to find nearby unknown planets. However, to get mission funding, astronomers need to predict how many planets they expect to identify. The authors of today’s paper took on this challenge with their three step modelling plan: 1) predict which stars would be observed, 2) randomly assign planets around them and 3) test if they are detected. Determining which stars TESS is likely to observe is made easier thanks to the Candidate Target List, a ranked list of 3.8 million stars most suitable for detecting small planets (where “small” means a planet with radius smaller than 4 Earth radii). The Candidate Target List contains isolated dwarf stars brighter than TESS magnitude 13, which will be less blended in the giant TESS pixels (each pixel contains 21 arcseconds of sky compared to 4 arcseconds in Kepler). The authors calculate how long TESS can observe these stars and those most likely to be priority targets. Data for priority targets will be available as observations every two minutes (at two minute cadence) whereas other stars will only have data in the full frame images every 30 minutes. Each star in their list is assigned 0 or more planets according to a Poisson distribution. Each planet is then given random properties, including inclination, orbital period and radius based on the general trends found by the Kepler Space Telescope. Periods are drawn from distributions between 0.5-85 days for planets orbiting A/F/G/K stars and between 0.5-200 days for planets with M star hosts. Time of the first transit is then drawn randomly between 0 and the length of the period, which can be after observations finish, meaning no transits will be seen. Finally, the authors test whether the transit signal is significantly stronger than the noise. The signal strength is determined by considering the number of transits, the transit depth and duration, and the extent of contamination from nearby stars. If the signal is greater than 7.3 times the TESS photometric noise level (7.3 SNR) and at least two transits are seen, this optimistic model claims a detection. Figure 1: Planet numbers detected by radius using the optimistic model. Red bars indicate the numbers of planets detected using 2 minute cadence data. Numbers above blue bars show the combined number of planets found in 2 minute cadence or full frame images. Note the log scale of planet numbers. From Figure 5 in today’s paper. 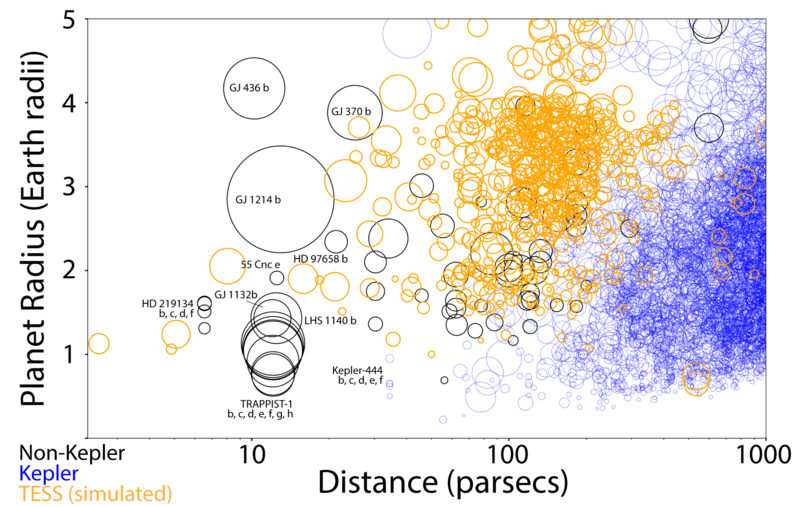 The optimistic model above identifies ~4500 planets around stars in the Candidate Target List, split into planet radius in Figure 1. For stars with V magnitude brighter than 12, the authors predict the detection of 1317 small planets. If 20% of these are amenable to radial velocity follow up, this would triple the number of small planets with measured masses and exceed the TESS main science objective of identifying 50 small planets with measurable masses. Predicting planet numbers means astronomers can plan the amount of follow up observations necessary to confirm planets. Not all transit-like signals will be due to transiting planets, they may be caused by instrumental effects or astrophysical false positives, such as deep eclipsing binary signals blended to give shallower transits, especially with multiple stars on the same pixel. Today’s paper predicts for every true planet found there will be one astrophysical false positive in the 2 minute cadence data and 5.5 astrophysical false positives in the full frame images. 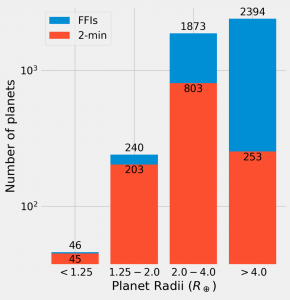 Figure 2: Planet numbers detected by radius using the conservative model. Green bars indicate the numbers of planets detected using 2 minute cadence data. Numbers above orange bars show the combined number of planets found in 2 minute cadence or full frame images. Note the log scale of planet numbers. From Figure 12 in today’s paper. Identifying planets based on fewer than three transits and detecting all planets with SNR ≥ 7.3 is very difficult. The Kepler Space Telescope is capable of identifying planets from one or two transits in K2 data, but only with additional investment of limited space-based follow up or in cases where other planets had already been discovered around that star. Analysis of Kepler data found that below SNR= 8-10, there were many spurious detections, so typically only targets with SNR > 12 were followed up. 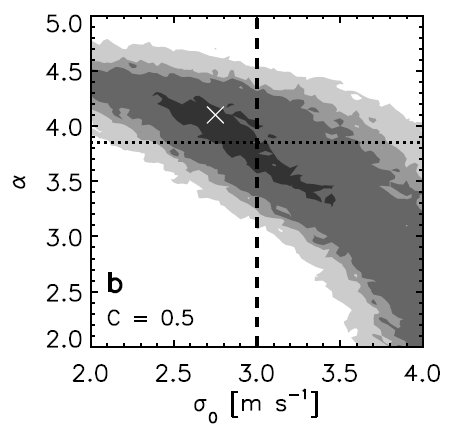 In their conservative model, removing planets with fewer than three transits or SNR < 10 reduced the number of planets detected by 60%, as seen in Figure 2. The number of small planets detected around stars brighter than V = 12 halved to 621. 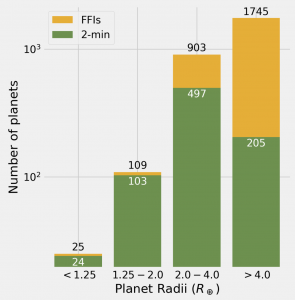 The number of habitable zone planets smaller than 2 Earth radii drops to just 6. Any small planets detected by TESS may identify new targets for atmospheric characterisation with the James Webb Space Telescope (JWST). Figure 3 shows simulated TESS planets greatly increase the number of known small nearby planets, some of which should be amenable to atmospheric characterisation. The authors estimate on the order of ten super-Earth planets could be found around bright M3 stars in the optimistic habitable zone, adding to JWST’s sample of temperate worlds. Figure 3: Simulation of small planets TESS may find (orange) as a function of the star’s distance to us. Kepler planet candidates are in blue and planets detected by other telescopes in black. The size of the circle is proportional to transit depth. Figure 14 from today’s paper. Today’s paper will be useful for planning follow up strategies and for identifying potential numbers of planets found in TESS 2 minute cadence data and full frame images. This is the first paper to predict planets based on the stars most likely to be observed from the Candidate Target List rather than simulated star populations. Where the authors also considered the hotter, fainter, giant or more crowded stars TESS would observe (excluded from the Candidate Target List) planet number estimates increased to 16,000. However the higher labour intensity to follow up and much higher rates of false positives mean few of these are likely to be confirmed. Today’s paper shows that TESS should greatly add to the numbers of known small nearby planets which we should be able to investigate further. Now we just need to find them!